This is the hydrangea shrub that blooms in my garden in mid-summer. The blooms start out green then gradually turn white. At the end of the blooming period, they again turn green. 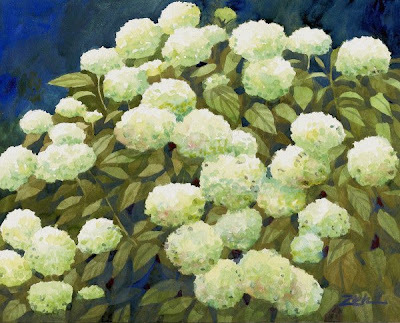 Annabelle is supposedly a smaller cultivar of the Hills-of-Snow hydrangea, but the shrub is not small. It is about 5 ft. tall and just as wide with large somewhat lacy white blooms. I have it growing right next to a rugosa rose bush which is just as large and which is an aggressive spreading shrub. But, so far, the hydrangea has held its own and kept the invader at bay. They make a nice duo when blooming together.